When Chicagoans go to the ballot box next week, some of us will have an extra line on the ballot asking: “Should the state repeal the ban on rent control?” The measure is advanced by the grassroots Lift the Ban coalition (photo credit to their website). Let’s take a look at the features of this referendum. This is a complicated measure. Most importantly, because we do not have direct democracy for issues like this in Illinois, the measure is only advisory. No change in the law can actually happen because of the referendum’s outcome. As if to illustrate this point, one of the other measures on the ballot asks: “Do you support a comprehensive strategy to address the opioid and heroin epidemic?” Who would vote against that? But there is not even the suggestion of what such a “comprehensive strategy” might entail–all the details are left open for interpretation, and are subject to all the same normal representative-legislative processes as all other issues. The story is similar for the rent control measure: while it is more specific (calling for a repeal of a specific measure), it doesn’t really specify what the ultimate plan might be, because this isn’t the right institution to pursue it anyway. Analysts disagree about the probable effects of the effects of a rent-regulation policy, especially because “repealing the ban” wouldn’t necessarily imply any particular positive step forward. Economic theory generally predicts that imposing a price cap on a good will lead to less investment and some unexpected and undesirable market outcomes. In this case, we might expect fewer new rental units, less investment or maintenance in existing units, and sale of units as condominiums because of a lower profit margin rental properties. On the other hand, evidence from New York and San Francisco (two of the more heavily regulated rental markets in the country) is more mixed, and both places are still booming rental markets, particularly at the high end. It’s also true that while most of the apartments in New York are rent-regulated, they’re not rent-controlled: rent control implies a cap on rents, while in NYC most units have a cap on annual increases in rent, which is a different ballgame that stabilizes tenants’ lives while not eliminating the incentives to be a landlord. And in the big picture, there are strong arguments that changing the way we think about real estate as a commodity might help out not only those facing rapid rent rises, but everyone who isn’t very wealthy and reduce income inequality along the way. 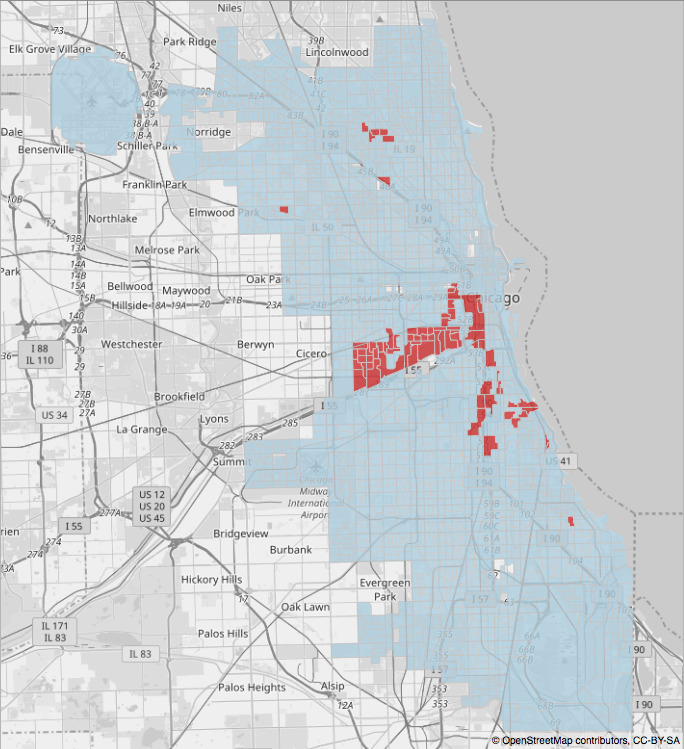 Figure 1: Red areas are precincts where the rent control measure will be on the primary ballot. There doesn’t seem to be a strong relationship between rent affordability and mobilization for the rent control measure; if anything, more Chicagoans are having a hard time with rent elsewhere. But notice that in almost all of Chicago, more than 1 in 3 households is paying more in rent than is considered affordable according to federal standards. Even if most of the city won’t see rent control on the ballot this month, there might be a very fertile constituency for it if another political entrepreneur wanted to run on such a major pocketbook issue. Alternatively, it may not be the level at which a lot of the local community finds it tough to pay the rent, though. Looking at it a little different, examining how things are changing, can mobilize people into action in politics. 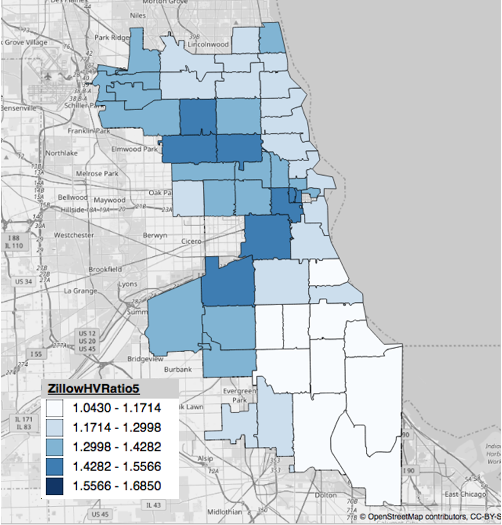 Figure 3 shows how fast home values are changing in different ZIP codes across the city, based on data from Zillow.com, a website that tracks home sales and rentals. The colors reflect the ratio of the median 2017 home value to the median 2012 home value in each area, so areas that are darker blue increased more quickly. 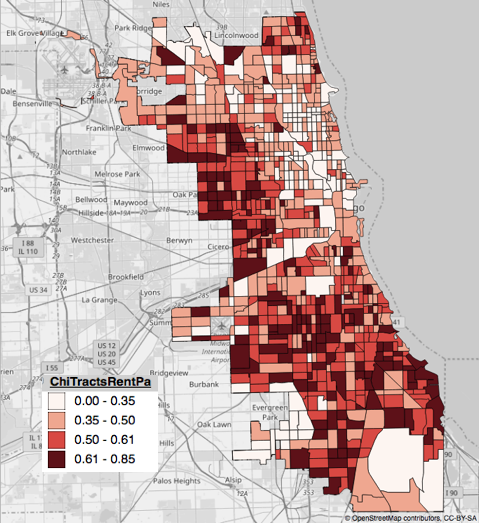 In this map, the strip of ZIPs southwest of the Loop is one of two areas where real estate has been increasing in value particularly quickly–increasing by more than fifty percent in just 5 years. Such changes drive processes like gentrification, which can create wealth for individual homeowners and developers (land owners), but tremendously disrupt communities and the lives of renters or others for whom land is not a commodity (land users). There may be particular pressure by landlords and others to raise rents in these areas, either now or on the horizon (even if rent affordability is not already particularly bad in these areas yet, relative to other parts of the city). So the activists behind Lift the Ban may be either seeking protection against ongoing seismic shifts, or getting it in early to build a democratic bulwark against potentially threatening market forces. The second thing to observe is that the ballot measures like this one–which are excluded from the city-wide ballot through somewhat arcane, inside procedures by the city council–reflect the location of organized activists moving on the ground to advance a new issue and get people to care about it. These movements take time to make formal changes to the law, especially when they face obstacles from above, and they can either grow or fade during that time. From 2011 to 2015, we saw a similar ballot initiative (the one supporting an elected school board) was only on a fraction of precincts’ ballots in 2011, but on many more in 2015. And in those places that picked up the measure between the two elections, turnout was up and support for Emanuel’s re-election bid was down. If the rent regulation measure is like most of the other ballot measures in recent memory, support will be very high–the real variation is in where it made it to the ballot, not how voters feel about it. In general, it’s not clear that direct democracy measures do much to increase overall turnout or affect other questions or candidates on the ballot. But if we take a look and examine these policy questions as a measure of citizens’ preferences, but about the range of issues people are activated on and willing to examine through politics, they can serve as a bellwether of both citizen engagement. Collecting signatures for a measure that will only be a first step toward reform requires a lot of effort, and people willing to make this initial effort may have permanently changed their behavior and dispositions for action down the road. In this view, these grassroots ballot measures might serve as early indicators of what kinds of things Chicago’s politicians might consider to stay responsive to the electorate. This week! Register, Vote, and Run.